In a world where even Tom Hanks has a franchise it's something of a shame America's favorite actor isn't in a better one than this. 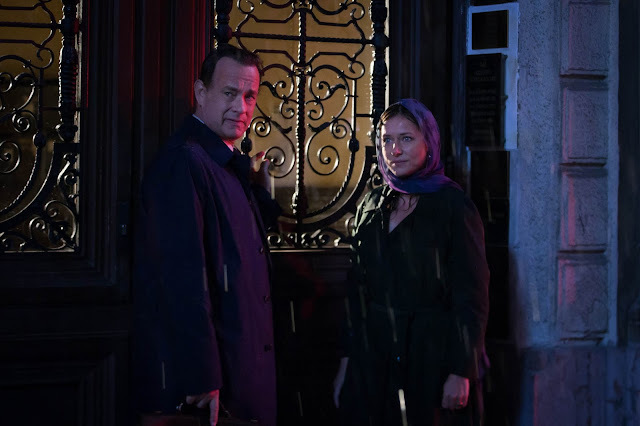 That said, the now trilogy based around symbologist Robert Langdon (Hanks) and based on the wildly popular series of novels from author Dan Brown are movies of pure junk food status and aspire to be nothing more than appeasing puzzles audiences unravel along with Langdon and whomever his next adventure decides to pair him with. Though the novels are said to very much be of the same variety as far as quality is concerned (I haven't personally read any of them) it is easy to see why there are such pleasures to be taken from the high caloric intake these movies serve up despite the lack of any real weight or nutritional value. Mystery adventures such as Inferno and its predecessors should be taken at face value and little more. There is an obvious factor to an actor of Hanks caliber taking on such a role if he were going to choose an ongoing series of films to be a part of in that Langdon is always the smartest guy in the room and Brown's novels along with the film adaptations spout facts upon historical facts in order to present the facade of intelligence and inventiveness, but while there is certainly an amount of creative ingenuity that comes along with writing any piece of fiction much less one that concerns ancient architecture, Renaissance artists, and their personal lives-each containing clues that further both the main mystery and the arc of its protagonist-there is also something inherently ridiculous to the quest Langdon and his peers are asked to go on. Making huge leaps to vague conclusions time and time again and encountering more secret passageways in old museums than there are plot twists, Inferno falls perfectly in line with the two previous films in the series if not more with 2009's Angels & Demons which saw director Ron Howard and his team taking things a lot less seriously than they did with the still daunting and tepidly paced The Da Vinci Code from 2006. Still, as its seven years on from the last sequel Inferno can't help but to feel a little less inspired and a little more under baked as it's obvious the only reason Hanks and Howard returned to this world and this character was for secure box office returns and likely the chance to make something they're a little more invested in. Whatever the case may be, Inferno is serviceable if not rather forgettable in its brisk pacing and handsome presentation. In other words, Inferno is little more than empty calories, but often times enjoyable calories nonetheless. Professor Robert Langdon (Tom Hanks) and Sienna Brooks (Felicity Jones) look to Dante's mask for clues. 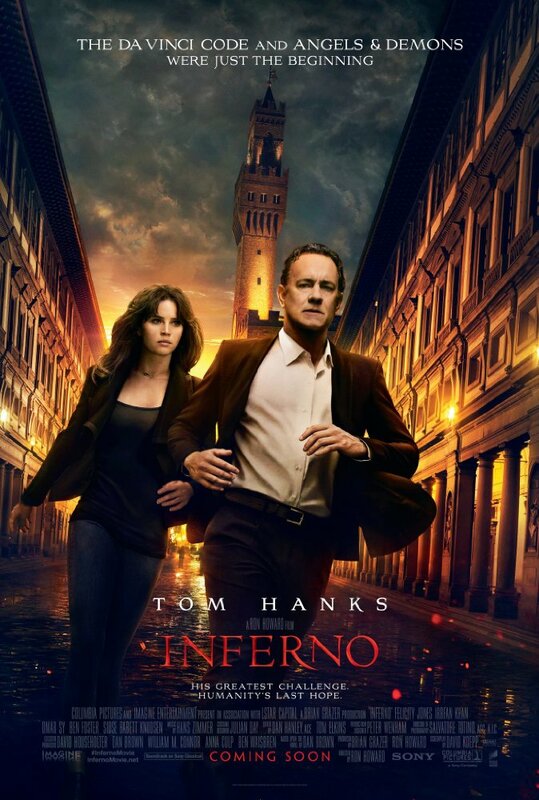 In Inferno we are witness to a Professor Langdon waking up in a hospital in Florence, Italy with no recollection of how he came to be there or any memory of the last forty-eight hours. He is attended to by a young doctor, Sienna Brooks (Felicity Jones), who informs him he was brought in by a cab driver with wounds that would suggest a bullet grazed his skull and came awfully close to killing him. Without warning a police officer, on her way up to see Langdon, begins shooting the nurse outside his door forcing both Langdon and Brooks to escape the hospital and subsequently begin piecing together how Langdon ended up in the hospital and why there are people trying to kill him. Brooks brands herself to be a fan of Langdon's as she saw him speak when she was younger, studied the Renaissance, and furthermore, the work of the late middle ages poet Dante with which the antagonist of this adventure, a billionaire geneticist named Bertrand Zobrist (Ben Foster), seems to have had an acute interest in as he has left clues for Langdon in the form of alterations made to Sandro Botticelli's painting of Dante's Inferno. That first part of Dante's epic poem, "The Divine Comedy", that guides the author on a journey through the many stages of hell now serves as the plot device for this hunt through treasures if you will as Zobrist has positioned an engineered disease, one worthy of plague status, to halt the growth of humanity somewhere in the world. Zobrist believes the issue of over-population to be one that is firmly out of control and who plans on doing something about it. Though this is the essence of the quest Langdon and Brooks are on it would be all too easy to allow these characters to serve as the core of everything that happens in the film and so in adapting Brown's no doubt intimidatingly complex novel screenwriter David Koepp (Angels & Demons, Spider-Man, War of the Worlds) has layered in countless other secondary players to make us look in one direction or the other when it would have benefited both the story and the audiences level of investment to remain focused on the growing camaraderie between Langdon and Brooks especially given the arc their relationship takes. With the likes of a World Health Organization agent in Christoph Bouchard (Omar Sy) on their tail along with his superior, Elizabeth Sinskey (Sidse Babett Knudsen), with whom Professor Langdon has a past, and not to mention the head of a shadowy consulting group (Irrfan Khan) in the picture there are simply too many players on the board for the narrative to remain as lean and effective as it should. While the lighter tone and swifter pacing of Inferno is certainly appreciated and even admired in most instances the clear dissonance between The Da Vinci Code and this latest installment is clear in terms of both its ambition and its craftsmanship. From the opening credits it's clear this series no longer considers itself to be as regal as it once positioned itself to be. While I wasn't necessarily a fan of the first film I always appreciate a movie that tends to at least try and put forth an effort to build its own lore and the title sequence is always a large indicator of just how worthy a film considers itself of serious consideration. In The Da Vinci Code there was great care taken to relay the mystery and the grandeur of that mystery in the reveal of the title, but with Inferno the title of the film is passed along the screen in the same text as the crew credits and hardly given a larger musical cue to indicate what it represents. This isn't just true of small, what some might call insignificant details within the movie, but it's also apparent in the story Brown's novel is telling with its more serialized tone. The severity of the plot may be as serious as ever given we are talking about an extinction-level event here even if, like most antagonists plans in movies with world destroying plots, that plan is overly complicated and ridiculous, but more to the point is the fact the implications of the quest Langdon is on are nowhere near as great as in The Da Vinci Code. It's a tough line to walk considering what Brown unwrapped with his debut Langdon book was that of an alternative religious history and how the meaning of such a different history might affect the beliefs of Christians that make up a large portion of the world's population as it's not every day such revelations or ideas are brought to the table. On the flip side-if such earth-shattering discoveries were continuously brought to the table they would register even more outlandish than the current plots Brown offers up. With that being the case the mystery to crack in Inferno simply feels more rote due to the fact it simply states an idea and an extreme resolution that must be stopped rather than suggesting something that could change people's perspective on things and create interesting conversations. That may sound ridiculous given the plot of Inferno deals in wiping out 95% of the world's population as well as the fact the main idea this plan springs from is as interesting as it is when presented with the facts of how quickly the population has risen on our planet. And yet, no matter how much truth there is to such data it's hard to believe anyone having conversations around Inferno at all, much less about the truths it might have exposed. Langdon and long lost love interest Elizabeth (Sidse Babett Knudsen) re-connect before things go awry in Inferno. As far as surface-level entertainment goes though, one could do much worse than Inferno. For as many pitfalls as this thing falls into as far as familiar beats of action adventure stories are concerned and as generic as it can sometimes feel with Hans Zimmer clearly borrowing from a few of his past scores to provide the musical backdrop here there are facets to Howard's film that are easy to like and easier to be entertained by as long as one doesn't allow too much logic to seep into the experience. The first and most obvious example of such aspects is that this film begins by placing its hero, Professor Langdon, in a state of uncertainty given the head trauma that has left him with no memory and an affinity for being more direct than he might usually be. This alteration in the attitude of Langdon for the first half of the film adds a fun, new dimension to the character while also giving the dynamic between Langdon and his obligatory female co-hort a fresher energy than expected. Speaking of the obligatory female co-hort, at thirty-three years of age Jones is just shy of being three decades younger than her co-star and while it was slightly concerning upon first hearing Jones was cast to star opposite Hanks in this latest installment fortunately this casting choice comes with justification in the form of one of the plots few solid twists. Like the players involved in the game the game itself has a few too many deceptions as well whereas were two or three to be removed or conveyed in more subtle ways the film would seemingly have been lent a great deal more credibility. As things go though, Jones does a fine job of playing the admittedly tasty arc she has been given as upon initially meeting the character the questions of what makes her so interesting were plenty. Jones is a talented presence who has an uncanny ability to make you empathize with her no matter the character she is playing and she demonstrates that here in some of the smaller character moments that didn't even have to necessarily be present in a big studio movie such as this. And while Hanks is clearly still having fun playing the lead and as Jones lends the picture something resembling depth in its otherwise shallow sea the esteemed supporting players are more or less playing up the campiness of the content, especially Khan and Foster. And so, as Inferno is simply another in a line of Langdon adventures that amounts to little more than elaborate schemes designed to get a bad guy what they want and to test Langdon to see if he can stop them in time it seems one can't complain too much when such a formula is composed as adequately as it is here. It's all moving parts and very little heart.